Meet Sushila Devi, aged 30, mother of three, resident of Itaha village, Muzaffarpur district of Bihar, India. Her husband, Ramanand Rai, works in a garage in Mumbai and earns around INR 5,000 per month. 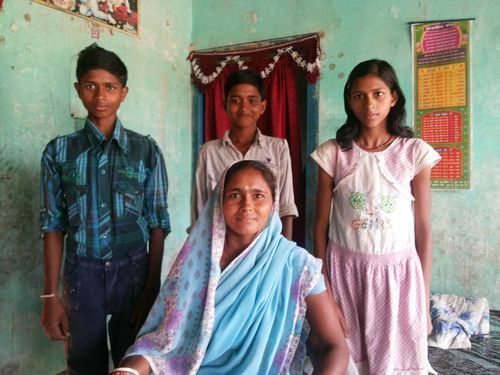 Sushila has two sons, aged 15 years and 14 years, and a daughter, who is 12. All three children study in Itaha Middle School; after school all of them help their mother out on their farm. Ramanand sends around INR 1,000 every month, which does not go a long way to support the family. Sushila dreams of her children growing out of poverty, and hence, her insistence on them attending school regularly. Not having any land of her own, Sushila had taken 1 kattha (750-2000 square feet) of land on lease and grew seasonal vegetables, sharing half of the yield with the land owner and using the rest to feed her family, their only source of subsistence. In 2010, Sushila came in contact with the Bihar Rural Livelihoods Promotion Society (also known as JEEViKA), an organization that works toward social and economic empowerment of the rural poor. She bought a cow using a loan she took from the organization. With the money that she earned by selling the milk to a local co-operative, Sushila repaid the loan and took some more land (5 katthas) on lease. She began cultivating okra (bhindi), corn, and rice and sold the produce in the local market. Though she shares half of the yield with the owner, she still manages to earn INR 2,000 to INR 2,500 per month by selling the vegetables. As a member of the Saraswati Self-Help Group (one of the many women’s self-help groups engaged with JEEViKA), Sushila has been regularly attending Digital Green-enabled video screenings on local best practices, videos that members of her community have produced and also helped disseminate. She regularly practices the farming techniques featured in the videos, for instance, making and using neemastra (natural pesticide made from neem) and ghanjeevamrit (liquid manure fertilizer). Sushila feels that although these techniques require more effort than traditional farming methods, she saves a lot of money she used to spend on seeds and pesticides. She has saved enough to pay for her fields to be watered regularly. Today, Sushila is the proud owner of a one-room pakka house, built using her own savings, without any financial assistance from her husband or in-laws. Her aspirations haven’t ended with her own house nor has her determination to realize her dreams waned. She wants her three kids to grow up to be salaried professionals and help take their family out of the clutches of poverty. Sushila dreams of the day when she can confidently tell her husband to return from Mumbai for good and they can all stay together as a family forever. The Digital Green approach to community development and education was recently hailed as “highly promising,” offering “an excellent opportunity to respond to key human development needs in nutrition and agriculture,” according to a report by USAID’s Strengthening Partnerships, Results, and Innovations in Nutrition Globally (SPRING) project. Visit the Digital Green site to read more inspiring stories or watch some of the videos that inspired Sushila. You can also find out more about Digital Green collaborations with TCi in this blog post, or upcoming Digital Green projects in this video message from CEO Rikin Gandhi.